Perfect for fans of Ready Player One, the Maze Runner series and the Divergent series. The New Agenda is the prequel to The City Center. During Ava's mainframe searches for Chief Morray, she hits his archive files and goes way back to Morray's teen years. Society was collapsing but young, idealistic William Morray had hoped his father’s acclaimed Repatterning Program––a precursor to the New Agenda––could get things back on track. They said the Repatterning was for the greater good, but it was a lie. William joins an underground alliance to put an end to the Repatterning and save what’s left of civilization. If he doesn't stop his father in time, there won't be anyone left to save. This thrilling young adult sci-fi series follows Ava Rhodes as she fights against Chief Morray to save her people from his maniacal new agenda to control all human life. - Also available in a Box Set, see author page for details. Be sure to check out VOICES OF THE APOCALYPSE - A SHORT STORY SERIES. - "The New Agenda" is a beautifully written prequel to "The City Center". The unpredictability blew me away. The story has unexpected twists, realistic human traits, and a frightening reality. - I loved this book, getting to see some history as to what eventually led to the lives being lived in The City Center. I tore through this book in one sitting because I just could not put it down!! It's seriously that good!! !- If you like good sci-fi and individual thought from an author that tells a story in a unique and undefined manner, this book is for you. If you like good fiction that you will dive into, this book is for you. If you geek out on complex characters, this book is for you. If you dig dark angles, this book is for you.- Great story, very entertaining. I really enjoyed reading this book, the only drawback was that it kept me up way past my bedtime. Can't wait for the next installment.- Getting to see the backstory of what shaped the character of William Morray was fantastic. If you've read the first book, "The City Center" (which you should!) then you understand where he ends up, but not how he got there. They say the road to hell is paved with good intentions, and the world of "The New Agenda" truly illustrates that. The pacing is great, it held my interest and stayed exciting throughout, and it threw in some unexpected turns while keeping me intrigued for the next installment. Highly recommend.- I promise that you will truly enjoy "The New Agenda" but both books fit so seamlessly together that they read quite well in either direction. You gotta' read both of them.... but you can start with either "The City Center" or "The New Agenda" and still completely enjoy the story.- The New Agenda is a fantastically fun read. I highly suggest reading City Center first. Neither will disappoint. 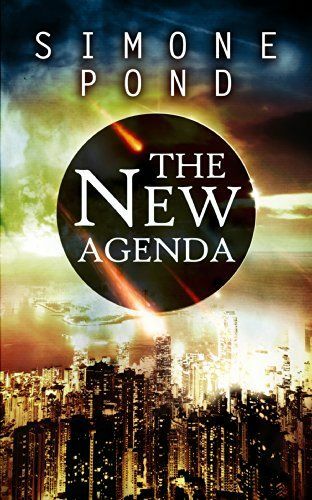 It's full of heroes to love, and villains to hate.- “The New Agenda” fuses good ol’ fashion “coming-of-age” storytelling with “poop-hitting-the-fan” sci-fi and healthy sampling of “conspiracy theory” in this charged, thought-provoking and page-turning yarn. Scroll up to buy your copy!